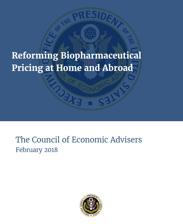 Late last week, The Council of Economic Advisers which operates within the Executive Office of the President released a nearly 30 page white paper outlining issues related to the ongoing increase in costs associate d with pharmaceutical drugs. The report was broken into multiple parts, ranging from introducing this issue, describing how Americans are paying higher prices for prescription drugs than the rest of the developed world, and finally how we might improve innovation to reduce the overall price of healthcare. Within the sub-parts of the document were topics including how Medicaid and Medicare procure prescriptions for their participants, how other world markets are benefiting from the U.S. led innovation and development, how middle-men known as Prescription Benefit Managers are inflating the overall cost of prescriptions, and the lengthy process by which drugs become available in the marketplace. While the original intent of the White Paper was to both outline problems and offer up solutions, the document favored the former, and provided little by way of real policies that might impact the rising cost of prescription drugs. We agree with the information provided in the brief; however it fell short in the areas of solutions only offering few suggestions limited in substance. Healthcare is a real problem in the United States making up 18% of the Gross Domestic Product. Of the $3.4 trillion spent on healthcare each year in the United States, roughly 20% of that number, $457 billion, is on prescription drugs. Said differently, for every $100 generated in the United States, $2.50 is spent on prescriptions. Last month, GDP released a four part series of blogs/videos outlining our ideas for solving the healthcare crisis in the United States. While the four parts go into great detail, this week’s blog/video is a brief summary of our solutions. For more details, we encourage you to view all of the video’s within the series. GDP Advisors is a consulting firm specializing in the area of Employee Benefits & Risk Management. With more than three decades of experience, the leadership team at GDP has successfully put together national programs for multiple organizations. Copyright © 2013. GDP Advisors . All rights reserved.